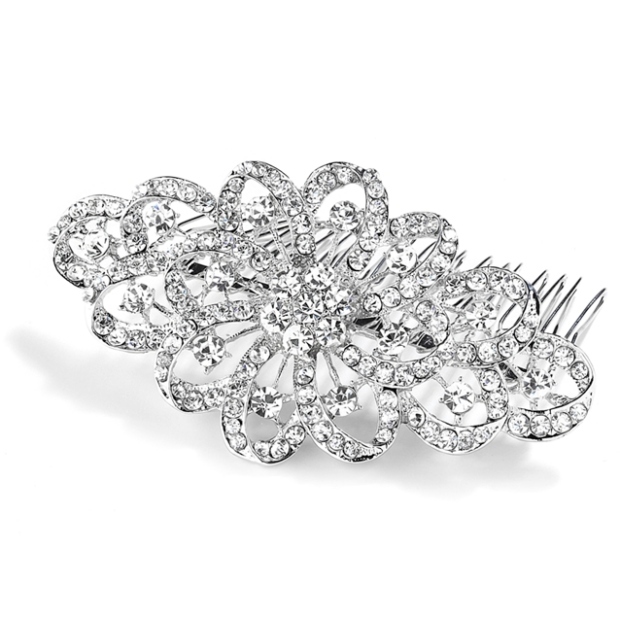 * Mariell's dazzling Crystal Hair Comb is 4" w x 2 1/4" h.
* Our bold headpiece is plated in Antique Silver Rhodium and is the ideal hair accessory to adorn Wedding, Prom, Homecoming and Pageant hairstyles with 100's of sparkling crystals at a great price! * Mariell's dazzling vintage crystal comb is the latest in bold wedding or prom headpieces which are "jewelry for the hair"! * This beautiful comb will give your customers maximum glamour at an exceptionally affordable wholesale price! * Add this top-selling comb to your store's Hair Accessories display today and we assure you fabulous reorders!